The words artist and designer seem so huge to me. Like in order to fulfill one of those roles, you have to be comparative in talent to Monet or Chanel. Sure, I like to sketch and come up with fabric patterns in my spare time, but I don’t consider myself a designer. This hesitant feeling and lack of confidence in my work has prevented me from even ordering a few yards of my own designs from Spoonflower. Nothing ever seemed finished or worthy of being printed. I was even asked by someone if I would put my designs on Spoonflower, and my response was that I wanted to wait until I had a whole collection of works that I was really proud of. Just a few days ago, I remembered that the beauty of Spoonflower and other printing sites like it is that you don’t have to be a “designer” to anyone else but yourself. No one else has to like or share my work for it to be valid. It is mine, and I enjoy creating it. So I finally ordered my first few yards of fabric with my own design. The design was born out of walking through the Catedral de Sevilla in Spain. The cathedral is bursting with gorgeous patterns, and when we were there, the courtyard was full of orange trees with vivid fruits everywhere. In my little idea book, I quickly painted a small orange to remind me of my experience in Spain. 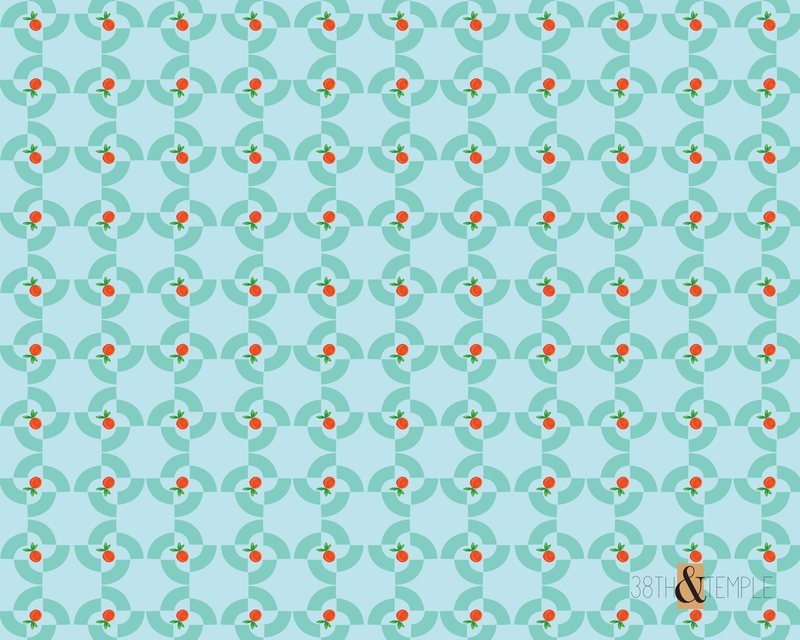 I can’t wait to see the fabric I had printed, and I wanted to share the pattern with you as a desktop background. My point is that if there is something creative you are wanting to do (that obviously isn’t hurting anyone), but you are lacking the confidence, just go for it. Enjoy!